Dr. Gordon Reece, a pioneer in the computational fluid dynamics field, has died at age 76. For him role of the University lecturer was not just about the push to publish and add to the research cannon, rather he was passionate about using his position to improve the lives of others. Cenaero, leading Research Center for Aeronautics, and NUMECA International have announced a strategic partnership to combine advanced optimization and data mining technologies, in NUMECA Design and Optimization Software Environment FINE/Design3D. Cenaero is well known for its advanced simulation activities and in particular for its software tools Minamo that includes state-of-the-art automatic optimization methods for simulation-based optimization. 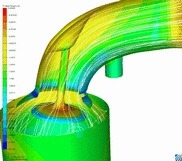 NAFEMS will hold CFD for Structural Designers & Analysts, a three-session online training course beginning February 22nd.